The holiday season is here! No matter if you celebrate Christmas, Hanukkah, Kwanzaa or all three, we’re excited to share in the holiday spirit. It’s easy to get caught up in the festivities, and while you’re busy decorating the house, safety may be one of the last things on your mind. 1. Keep live trees away from heat sources. Place your tree away from fireplaces and heaters, and keep a fire extinguisher near your tree. Live trees are highly flammable, due to needles and sap. A dried-out tree can catch fire faster than one that has been properly watered. Check the water level every other day to ensure proper hydration. Starting with a green tree is one way to keep it from drying out so quickly. If you buy an artificial tree, make sure it’s labeled “fire resistant.” Fire-resistant trees are less susceptible to catching fire. 4. Don’t burn wrapping paper in the fireplace. Paper can catch fire very quickly and can cause flash fires. Instead, recycle (or better yet, reuse!) your wrapping paper. 5. Work as a team. When stringing lights and decorations above your normal reach, make sure you use a proper ladder with someone supporting the base. 6. Double-check your lights for safety. Replace any lights with frayed wires, broken sockets, and loose connections. The CPSC issued new guidelines for seasonal light safety in 2015, setting a minimum wire size, and standards for strain relief and over-current protection. 7. Power down before you turn in. Turn off all lights when you go to bed and before leaving the house to avoid a short that could start an electrical fire. 8. Prevent electrical cord damage. Don’t mount lights in a way that might damage the cords, and avoid using nails or tacks. Use hooks or insulated staples instead. Keep candles on a sturdy base to prevent tipping. Never leave a lit candle unattended. If you have fragile ornament, place them out of reach from pets and kids. 11. Skip the fake food. 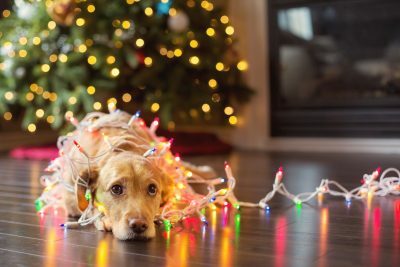 Avoid decorations that look like candy or food if you have young children — or pets — in the house. 12. Beware of poisonous plants. While festive, poinsettias are poisonous when eaten, so keep them out of reach of kids and pets.